The EZ-2 Elite is designed to efficiently concentrate or completely dry samples. It is compatible with a wide selection of sample holders, enabling evaporation from common sample container formats including round-bottom flasks, tubes vials and microplates. SampleGenie™ technology combined with a FastLyo programme on the EZ-2 Elite allows HPLC fractions to be concentrated and freeze dried directly into a submission vial. This innovation produces a weighable solid, eliminating manual handling, increasing recoveries and removing the chance of cross-contamination. Operating the EZ-2 Elite is highly intuitive: just load your samples, select maximum safe temperature for samples, select solvent type and hit start. Offering unattended operation through a suite of pre-programmed methods, the compact evaporator requires no user training, even a beginner can competently use the system within 5 minutes. 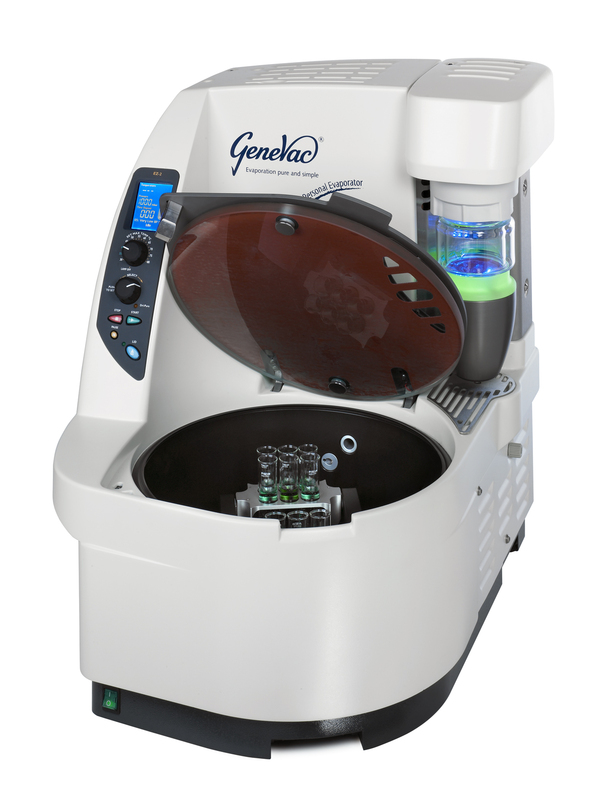 Drawing upon Genevac's technological leadership in high performance evaporation, the EZ-2 Elite is able to routinely dry stubborn samples. Benefiting from a high-performance scroll pump that delivers deep vacuum, the product is able to remove even high-boiling solvents such as DMSO and NMP and acidic solvents such as HCl. Internal heating of vapour duct and system components ensures that such challenging solvents only collect in the SpeedTrap™ condenser and not anywhere else. The condenser comes with automatic defrost and drain technology. The evaporator controls the condenser and the solvent collection vessel, offering mid-method defrosting and draining.